Just Romantic Suspense: How do YOU read? Congratulations to "Carmen M." and "LS", the winners in C.A. 's giveaway. Thank you to all who participated! I must admit, in the last few years I have become a total technology junkie. Well, sorta. I’m not a gamer or anything, but I can’t remember the last time I wasn’t glued to a cell phone (hanging my head here…just a little). But, I have become dependent on these items (especially the cell phone). I love to read. Always have. Since I learned how, I suppose. In the last few years, I mostly read e-books. It started when I got a Nook for my birthday a few years ago. I loved it right off the bat. I loved buying books without having to leave the house. I loved being able to finish a book if I was out and about (or stuck in the purgatory of my doctor’s office) and not having to wait to go home to get the next book. Having the choice to quit one book and start another. But my favorite thing is that I can have all my embarrassingly high amount of To-Be-Reads in one place and not take up the physical space in my bag, or in my house for that matter. Then I won a Kindle. Then I bought a tablet. You’d think that’s too much, but it’s not. Now, I have all my books on BOTH my devices in ONE place. And the screen is bigger, so I tend to do most of my reading on the tablet these days. (I also downloaded the KOBO app, I am so bad…still working on my collection there). I have friends who read ONLY real books. They say they have to have it in their hands. They like the scent of the paper, and it feels more real. I do get that. I love to walk into a library or bookstore. I love the smell of the books. I also have friends who read ONLY ebooks. I still do both, but I prefer ebooks. I am a super busy person (I work 60 hours a week plus write) so convenience is key for me, and it’s so darn easy to shop from the device. It doesn’t help the my impulse-buyer tendencies, but who can have it all? Hehehe. But the most important fact is READING in and of itself. The how (the media in this case) doesn’t really matter, as long as the books get read, characters and awesome writers continued to be discovered. How do YOU read? What media is your fave and which would you never check out even a fave book with? 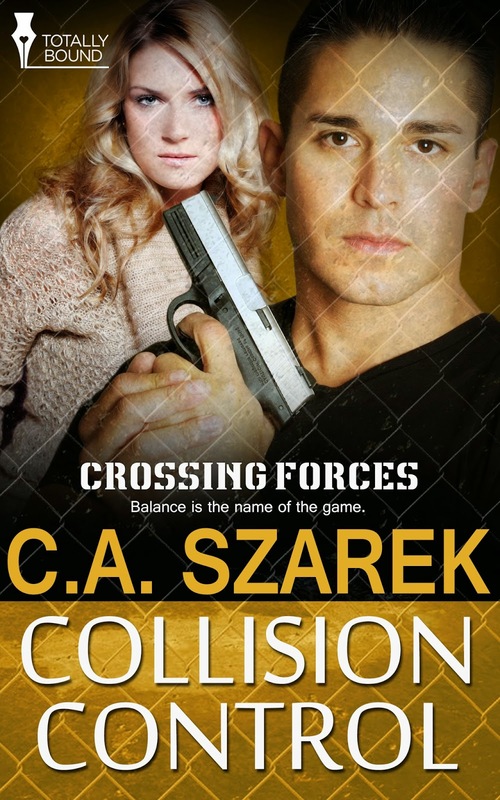 Collision (Crossing Forces Book Two), Calculated Collision (Crossing Forces Book Three) OR Collision Control (Crossing Forces Book Four)! Please make sure you leave your email with your comment! Opposites attract when a wild detective and proper kindergarten teacher collide while he’s chasing his own brother and trying balance his heart and his job. Giveaway ends 11:59pm EST Oct. 7th. Please supply your email in the post. You may use spaces or full text for security. (ex. jsmith at gmail dot com) If you do not wish to supply your email, or have trouble posting, please email maureen@JustRomanticSuspense.com with a subject title of JRS GIVEAWAY to be entered in the current giveaway. I read on my NOOK, which I love!!! I never leave home without it...I also have to have my phone, a Blackberry, which I call my Dumb phone. I need it in case an employee calls out sick day or night and other such crap. I would love to win, the book sound amazing!! !Thanks for the chance! I prefer print books. I have a kindle but I rarely use it. I will read a print books first. and I love to read. That's awesome too, Tammy. I get it, sometimes you need to feel a book in your hands. I'm too mired in technology to go back. LOL. ;) Thanx for the comment! I like to read on one of my ereaders. Most often I use my Kindle but I also use my Kobo, depending on the book format. I read print books too but that is not my first choice. I agree, Trish! I don't leave the house without something to read. Thanx for the comment! I enjoy print books and e-books... I read a lot more on my Kindle and Nook nowadays, but still love the feel of a print book in hand... It is funny, I have never taken my e-readers out of the house... if I go out and I know I have some time to squeeze in some reading, I bring a paperback. Hmm, interesting strategy. I can't seem to leave without my tablet, so I always have tons to read. ;) Thank you for the comment, Colleen. I read both print and e-books. I prefer print, but my Nook is great for traveling and space issues. I agree, Taurus! However, I still have tons of books. Like more than 1000 I'm sure. and I do collect SIGNED books from authors, I have a special bookshelf! Thank you for the comment! HAHA! I would NEVER judge you, Carmen. I have 3 (if you count, nook, kindle and tablet, where I even have a KOBO App). When I get my new iPhone (soon) I will prolly start collecting iBooks, too. HAHA! After all, a girl's gotta have choices! Thank you for the comment. I read tree-books & e-books, via my Kindle. I still prefer a print copy in hand. Tree-books! LOL! I love it! Thank you for the comment, Mary! I totally agree!!! I have an android galaxy which I love b/c I can read my amazon books on and I also never leave the house w/out my kindle ;) I purchase bags and purses that "fit" my kindle. But I still love to read print books, I just don't take them out and about with me like I used to. I say about 90% of my reading is electronic these days. Thanks for sharing! Thank you for the comment, Erin! I loves me the choices of WHERE to read these days! I read both ways. I love print books and they look so nice and pretty on a shelf. But when Im out and traveling I read on a tablet with either the kindle app or ibooks. I read on my Nook and on my phone. jlleibel@yahoo.com Thank you! !